According to the National Psoriasis Foundation, 7.5 million Americans suffer from psoriasis. In those ranks are some celebrities as well, including five-time Olympic swimmer Dara Torres, who has done much work with the National Psoriasis Foundation to try to remove the stigma from the disease and raise awareness. Other ways the Foundation reaches a broader audience include the creation of Psoriasis Awareness Month, which is observed every August in the United States. Psoriasis Awareness Month allows the Foundation to educate people and encourage them to get involved in educating other people. Through the efforts of Psoriasis Awareness Month, more and more people are learning about the disease and its treatments. Start to design customized rubber wristbands now! If you are interested in spreading the word about psoriasis and helping to educate others during Psoriasis Awareness Month, you might be looking at multiple avenues to help. One of the best ways is to get people talking and to give them reminders about Psoriasis Awareness Month. And silicone wristbands are great for both. Eye-catching and fashionable, wristbands can be customized in awareness colors—orange and orchid—and can be imprinted with messages that add even more impact. Examples might be “Become a Psoriatic Psuperhero!” or “Nothing can stop your dreams. Not even psoriasis”. You can sell the bands as a fundraiser to donate to the National Psoriasis Foundation, or you can give them away as you educate the people around you. Psoriasis is an autoimmune disease—it is not contagious. It impacts a person’s skin, creating raised, red, scaly patches. Because the lesions are visible, the people who have psoriasis often try to hide their condition, wearing long shirts and pants even in the heat, so quality of life is impacted by the disease. Furthermore, according to Psoriasis Cure Now!, the condition is associated with other health issues including diabetes, heart disease, and stroke. The good news is that most cases are mild, and treatments are becoming more and more available. Wear them, share them, or sell them, and see how popular your Psoriasis Awareness Month wristbands become! At AmazingWristbands.com, we use 100% silicone for your awareness bands. We offer speedy price quotes, great customer service, free shipping, free artwork, free design, and no mold fee. 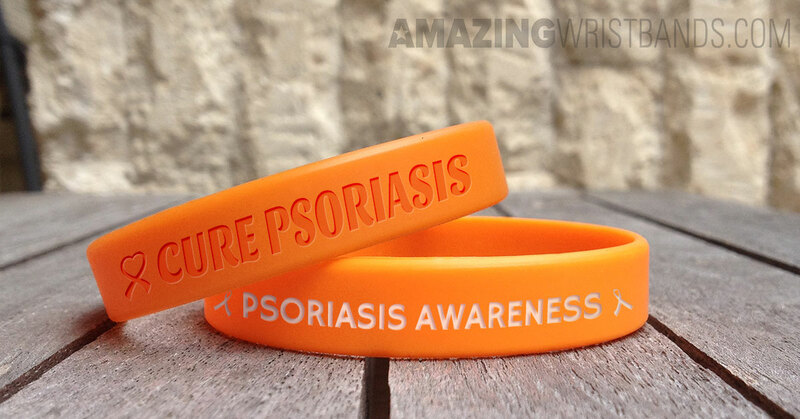 Create your Psoriasis Awareness Month wristbands online today!